Forty years ago we witnessed one of the great moments in aviation history as Concorde entered into commercial service. On 21st January 1976 British Airways GBOAA and Air France Concorde F-BVFA took off simultaneously from Heathrow and Paris. From the moment she first flew Concorde was an immediate icon, with a take-off speed of 250mph and a top speed of almost 1,554mph - faster than twice the speed of sound, Concorde turned the dream of supersonic flight for passengers into a reality. 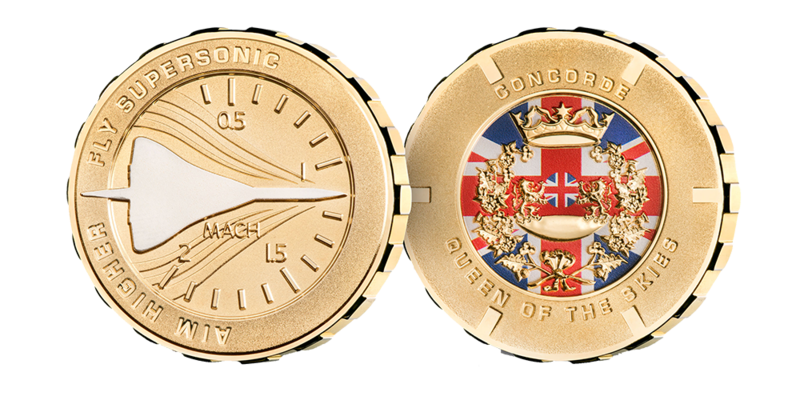 Now you can celebrate that historic occasion with the handsome Concorde 40th Anniversary Commemorative issued by Worcestershire Medal Service, the official medalists to Her Majesty the Queen. The reverse features a modern interpretation of the British Airways crest set within a classic watch style border. Set back from the crest is the Union Jack gloriously accented in red white and blue. The inscription reads “CONCORDE- QUEEN OF THE SKIES”. The obverse features a bird’s eye view of the airliner itself in the iconic Concorde white with a Mach gauge and sonic boom lines, surrounded by the legend ‘Aim Higher, Fly Supersonic’. Concorde remains the only supersonic aeroplane to have been in service as a passenger plane. In their 27 years of service BA’s glorious Concorde fleet carried over 2.5 million passengers in just under 50,000 flights. Today you can own a piece from one the jet blades of one of the 14 Concordes that flew the world from 1976 through to retirement in 2003. A lasting tribute to a magnificent era in aviation history. Strictly limited just 5,000 commemoratives have been issued worldwide. Layered in pure 24 carat gold each commemorative is presented with a signed Certificate of Provenance confirming the origin of the metal and its limited edition status.